this time of year.. again.. I hear the hooves of melancholia come chasing ..from some forlorn chasm.. my winter blues have come again. And the hunt master of the seasons sips his stirrup cup. Fall full and lusty crimson on the yet green lawn. Earlier each evening in the East. For the elders each weekend someone in the parish dies . Come ! There’s a nip in the air ! Ring in the Winter ! Lets route these wasted muted days ! © Copyright 2019 donkylemore. All rights reserved. wow, so wonderfully told! !I truly loved this glowing, very descriptive picture!! You are so talented, very creative indeed!!! This thing has been hanging in there in my mind for soem time. 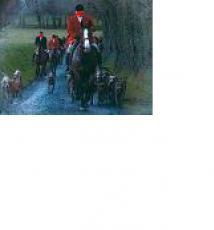 I saw the metaphor of the horse and hounds and the hunt pretty well early on. The chase and bringing in the autumn days which they are chasing is where its weak. I'll have to come back and " finish " it sometime . But thats me . a paragon of laziness. I run with a fligt of ideas with the concept ; then I cant get the glue to stick them together in a coherent way . What an amazing poem .Superb writing again from the master . I feel the braces in my teeth !! This page was created in 1.3581 seconds.